Happy day after Halloween!! I don't know about you, but I'm definitely feeling the effects of having way too much sugar last night after trick or treating!! Aside from the Munchkin's loot, we still have a good deal of candy leftover since we only had a handful of trick or treaters come to our door this year, which is still more than the 2 or 3 we got last year. And of course the Mr bought candy that we both like. I'm going to have to really restrain myself from not dipping into the bowl every time I pass it! Halloween day itself was pretty bustling around here. I didn't mean to but I ended up sticking around the Munchkin's school for most of the day - I couldn't help it, all the kidlets were just too cute in their costumes! Then there were last minute costume fixes, errands, and of course, trick or treating and the eating of said treats! In between all of that I was in a rush to finish my Halloween socks that I had cast on last week in hopes of wearing them out while trick or treating. I'm happy to report that they did indeed get finished in time. I'll confess that I was a little naughty a few weeks ago and bought a few skeins of yarn to make me feel better about the fact that I was not going to Rhinebeck. Not that I have been to Rhinebeck in the past, but still, seeing all the beautiful sweaters and yarn-y yumminess on Instagram made me a little wistful that I wasn't there. It also didn't help that a few indie dyers help sales during the Rhinebeck weekend. One of those indie dyers was Ashley from Nomadic Yarns. I've been eyeing her Slutty Pumpkin self-striping colourway for quite some time now but always held back on buying a ball due to the fact that I have a fair amount of not only sock yarn but self-striping sock yarn in the stash. Since I was in the mood to cheer myself up and the yarn just happened to be on sale...well...I have mentioned in the past just how weak I am in the face of self-striping yarn. Or for any yarn, for that matter. So I bought a ball of my beloved Slutty Pumpkin. But I didn't stop there. I figured since I was buying a ball, I might as well make the most of the shipping and added a ball of Halloweenie to my cart. You would have thought that between the two that I would have cast on the Slutty Pumpkin first, but the Munchkin loved Halloweenie so much that I decided to cast that one on instead. I originally wasn't thinking about getting them finished in time for Halloween but since this past week has been quite the stressful one, and knitting stockinette in the round can be so soothing, these socks had practically knit themselves up. 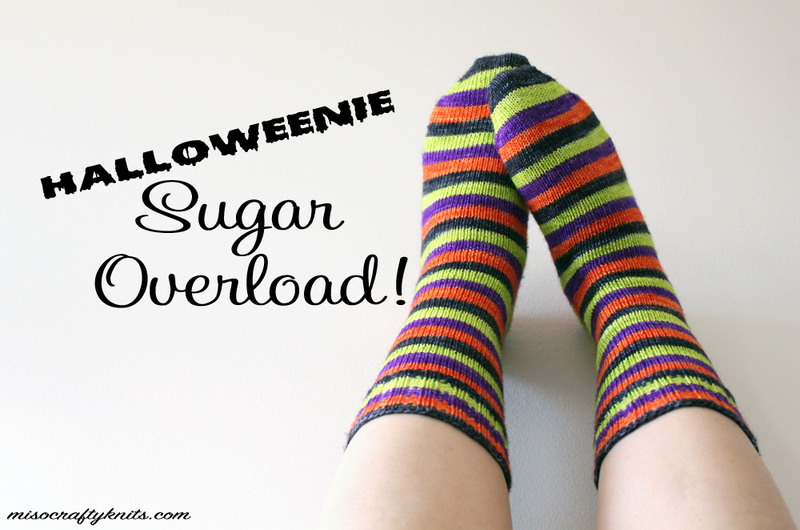 Being that Halloweenie is a self-striper, I automatically cast on to knit my usual plain vanilla toe-up sock recipe. When I got to the heel I was about to put in my preferred afterthought (or forethought? I guess depending on who you're talking to?) heel, when I decided to try something different. This time around I decided to give the Fish Lips Kiss heel a go. The first time I had knit this heel I had used my own hand-painted sock blank that was kind of stripe-y and wasn't sure if I would ever use this heel with an actual self-striping yarn. After a little thought and consideration (and some encouraging words from commenters from the first FLK heeled sock) I decided to just go for it. What do you think? At first I wasn't quite sure how I felt about that little black stripe that goes up the hinge of the heel, but after a while it grew on me. To make life easier on myself I decided to knit a full stripe before starting the heel instead of knitting half the stripe like I normally do for the afterthought heel, this way I could continue on with the striping sequence without any disruptions after I knit the heel. To make this work out so that my stripes are consistent and without sacrificing a stripe to the uneven "tiny stripe across the ankle" syndrome, I had to break the yarn after knitting the FLK heel and then cut out a few sections in my working yarn to get to the next stripe in the sequence. I'm pretty pleased with how it all worked out. I'm even more surprised that I really didn't have to cut out that much yarn (about 7 grams worth) or do much in general to make the socks match - as in I didn't weigh out my yarn ahead of time or wind it into 2 separate balls. I didn't even weigh out the yarn when I bound off the first sock and had just cut off enough yarn so that I could start with a black stripe. This could have totally backfired on me but I have a pretty good idea as to how much yarn I need to knit a sock and how much leeway I have within the basic sock yarn put-up to work with. With that said, I did grossly miscalculated how much yarn I needed to bind off using Jeny's Surprisingly Stretchy Bind Off on both socks and ended up binding off the last 10 stitches in chartreuse on the first sock and then the last stitch on the second. Needless to say, that bugged me. So on the first sock I ripped out those stitches, Russian joined more black yarn to the sock, and bound off. The second sock, I just left as is. I like to think I'm not that crazy and nitpicky (even though I totally am) and hope that solo chartreuse stitch will remind me to not be. We'll see how that works out. It's just a stitch, right? I absolutely love how these socks turned out. The FLK heel is quite the game changer, although I'll admit that I'm not sure I'm a full-on convert on using this heel method on all my self-striping socks. Or even on all my non-stripey socks, as I really do like a good heel flap. Also, I'm going to have to keep an eye on my gauge and keep note as to how much it changes in the next little while. My gauge on these socks is a little on the loose side and I really prefer the fabric of my socks to be slightly dense to make them a bit more stable and longer lasting in the wear department. I just might have to go down a needle size on my next pair of socks. But for now, even though Halloween is over, I'll keep strutting around in my new Halloweenie socks...that is, until the next pair comes off the needles! These socks are super! And I just put another dyer on my list!! I just wanted to let you know that you can do the heel for FLK from the opposite end of the ball so you don't need to interrupt the pattern. I know they talk about it in her ravelry group. Happy knitting! And the socks look great! !